I’ll admit to the fact that I’m a recovering politics junkie. In the heat of major political campaigns, one of my favorite pastimes is to flip back and forth, sometimes at intervals of less than a minute, between election coverage on MSNBC and FOX. It’s a sensation much like moving between each team’s huddle during the Superbowl. There’s something about the mix of shear horse-race/excitement, the high stakes/this outcome will affect the whole world aspect, and the malleable and fuzzy ethics of it all of that just never fails. I can’t get enough. Needless to say I find documentaries about political campaigns fascinating. In fact, during the 2008 Presidential Election and then again during the 2010 midterms I had a thought: it’d be fun to make an intense political-campaign doc about a high stakes election taking place in an elementary school. Perhaps in doing so, one could learn how deeply ingrained the often embarrassing if not frightening rhetoric our national campaigns tend to take on is embedded in our cultural. It turns out someone beat me to it. Not only that, they added an incredibly creative and deeply provocative spin to it: what would happen if that elementary school election were set in Communist China? Weijun Chen’s efficient and thought-provoking documentary, Please Vote For Me, follows one Chinese elementary school class’s experiment with democracy. 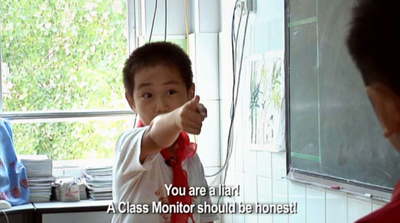 To teach students in the communist nation what democracy is, the teacher decides that this year the highly coveted position of class monitor (usually anointed by the teacher) will be decided by a class-wide election. The teacher chooses three candidates – the incumbent and two challengers – and allows her class to decide amongst them. What ensues is a riveting 60-minute lesson on Chinese culture, human nature, and the universal nature of politics. The film opens with a series of shots of the school children in perfect rows in the schoolyard singing their national anthem. The wide shots displaying the uniformity demanded of the children are reminiscent of Triumph of the Will and other Nazi propaganda pieces. The point is clear: in China, school is not a place that emphasizes the individual. After a few quick interviews in which children offer simple and rather dead-on understanding of what democracy is (in an idealistic sense), Chen jumps right into the story. The class of children is elated by the news of the election, none more than the three candidates. They each excitedly share the news with their parents. The parents’ reaction to the announcement offers an interesting glimpse into Chinese culture and the universal parental desire to help their children gain. The incumbent’s father, a well-off leader of the police force offers to help his child win his constituent’s hearts by using his own connections. He suggests taking the class on a trip on the city’s new monorail sponsored by the candidate himself. One of the challenger’s parents suggests buying gifts for the classmates to win over their support. The lone girl candidate’s single mother laments her own inability to help. She fears her status as a single mother will hurt her child’s chance of winning – if only her daughter had the support of two parents with time to put in her political future would be far brighter. Things heat up as the candidates engage in sabotage. During a talent show between the three candidates, one of the boy candidates conspires with his advisers to have a slew of classmates scream out “Terrible!” and “Out of tune!” after the young girl’s singing performance. The mostly tragic, somewhat comic result is a classroom of kids in tears – the girl’s supporters tears of embarrassment and outrage, the other candidates’ supporters those of guilt. Regular strategy sessions are held between the candidates and their parents discussing techniques to trip up opponents in premeditated “Gotcha moments” during the debates. Despite its lofty ideals, the lowliness of democratic politics it appears is universal. Politics is an internationally recognized full-contact sport. Scattered throughout these universal moments are those far more anthropological in nature – an intimate look inside the homes of working class families in one city in China. The contrast of this experiment in democracy and the culture’s strict and rigid norms are on full display during one of the debates: the incumbent is called out for being violent with the children to keep order in the classroom. His defense: “Don’t your parents hit you sometimes too? It’s necessary to keep things in order.” The class seems to agree with the analogy. I’ll fast forward and allow you to learn the election’s results on your own, adding only that the film ends as it began – perfectly straight lines of children in perfect posture, singing their national anthem as they raise the Chinese flag. It is a reminder that what we have just seen was merely an experiment, a small window through which the children were allowed to peak at Western-styled democracy. And the audience is left to ponder the sad and striking reality of the view. This entry was posted on Thursday, April 14th, 2011 at 9:10 am	and is filed under blog. You can follow any responses to this entry through the RSS 2.0 feed. You can leave a response, or trackback from your own site.